Before I jump in to today’s post, let me give you a little background information. The Whole 30 Program is something I stumbled upon last fall and fell in love with. It totally aligns with my philosophy on food and health. Basically, it’s a 30 day period (I loathe the term “cleanse”) where you focus on eating ONLY real, whole foods. No weighing, no measuring (your food OR your body) and NO fees – this is completely free and something you can do on your own. It’s meant to be a focus period to create healthy habits and eliminate any foods that are commonly problematic. At the end of the 30 day period, you add foods back in systematically to evaluate how they effect you. I started my first Whole 30 last October because I was just feeling like I need a re-start after having been ill and just not feeling my best. It was the best decision I could have made. I am very health conscious anyway, but I had found myself craving sugar and feeling very unstable in terms of energy. I stumbled upon the Whole 30, and come to find out, my sister had completed at least one herself and told me how awesome it was. That was all I needed to get myself started. Now, let me clarify, the Whole 30 program is SIMPLE, but it will not necessarily be EASY. This is also not a DIET! It is meant to be an experiment to find out how your body reacts to foods commonly known to be problematic. If you are currently eating a Standard American Diet, you may experience weight loss, but that is not the main goal. A year ago I was eating more processed food and dairy was probably my favorite food group. I used to have a Greek yogurt at least once per day, usually twice. I also didn’t pay attention to soy in the ingredients list of foods (Read this post from Wellness Mama for more info on why Soy is a bad choice). Jumping into the Whole 30 will require you to think more deeply about what you are eating. I’ll warn you right now that 99% of processed foods contain either sugar, soy lecithin, canola or wheat. I was shocked to find that even my Siracha contained sugar (I did find find a brand that makes Siracha-Cha that is sugar free, but it’s hard to come by! Try this recipe instead)! 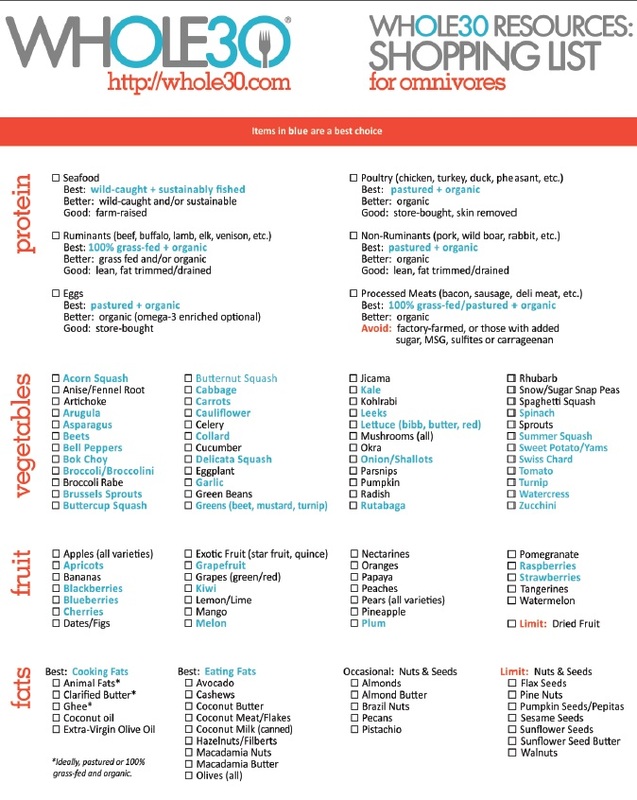 Your Whole 30 Shopping List! The first few days were difficult as I was “detoxing” from my sugar fetish. Soon enough though, the cravings passed and I was REALLY enjoying my whole foods only meals. My favorite dinner became steak with a balsamic/cherry reduction, broccoli and sweet potao – delish! I sometimes found myself still craving sweets and satisfied those urges with Larabars (Whole 30 approved!) or almond butter on a piece of fruit. As the weeks passed, I noticed my sleep was better than it has ever been. I slept like a rock all night long and woke up refreshed before my alarm even had a chance to go off. My dreams were more vivid and the rest was incredible. I actually cried tears of happiness at one point because I just couldn’t believe how good I felt! My Whole 30 ended on Thansgiving Day. You might think I couldn’t wait to dive into a buttery bowl of mashed potatoes, or grab a slice of pie, but it honestly wasn’t the case. By that point I wasn’t even interested in those foods; I was so completely satisfied with how I was feeling and eating. Over the following weeks, I did re-introduce dairy but found that my body did not love it as much as my taste buds did, which was hugely disappointing. I still only eat dairy very occasionally and have to decide if the discomfort will be worth the deliciousness (spoiler alert: Fro Yo is always worth it 🙂 ). I am also still grain free 98% of the time with the exception of rice noodles when I enjoy Pho Dang or the occasional rice cracker. 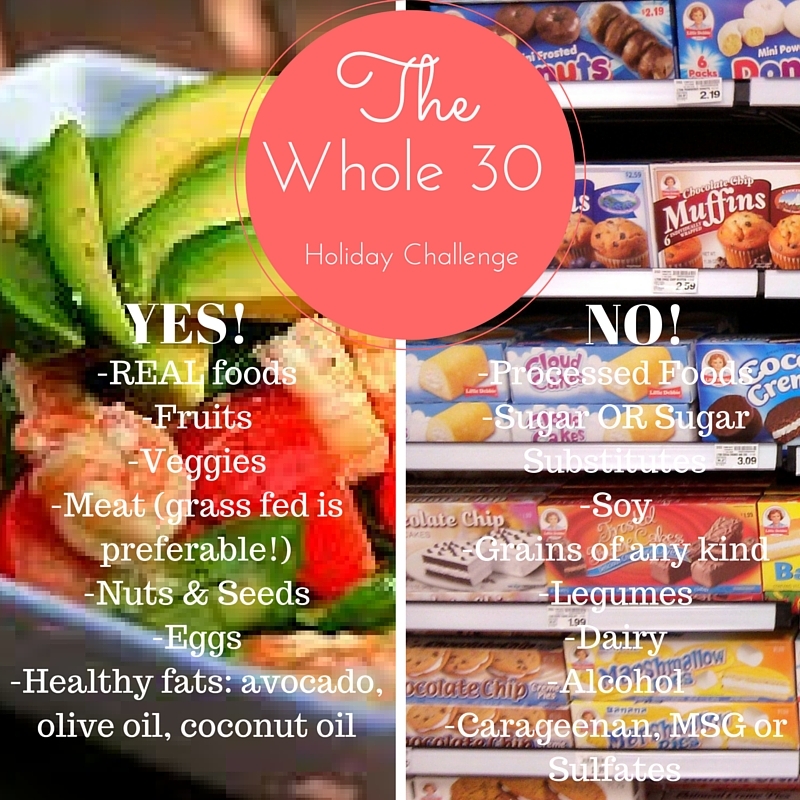 I said all of that to tell you this…I’m starting another, abbreviated Whole 30! If anyone would like to join myself and one of my college roommates/favorite people on this planet, Jess, you are more than welcome to! Jess will be doing a full Whole 30 while I may offer myself some leeway over Thanksgiving when we visit Paul’s family. I already know which foods to avoid, so for me it’s not as big of a deal to allow for a day of indulgence and get back to it. I would, however, like to start and complete at least one full Whole 30 beginning January 1st to kick the year off right! I’ll be posting updates and meal plans/ideas throughout the process. Please let me know if you have any questions. I hope you’ll consider joining us! I promise you won’t regret it. NEW Must Have + a GORGEOUS holiday look!